What Kind of Person was Noah Webster? Third grade teachers, have you ever had a discussion with your students that historical figures were real people, with likes and dislikes like the rest of us? Consider for a moment Noah Webster, who is known for writing the first dictionary of English as used by Americans. 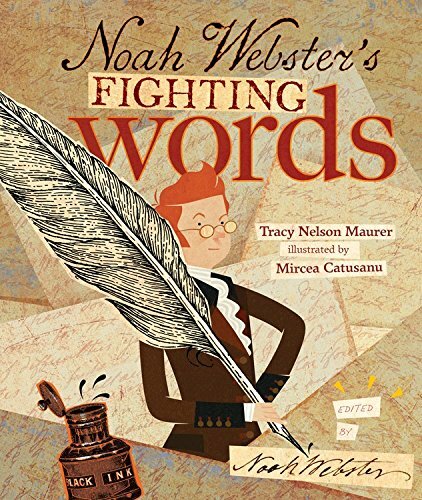 NOAH WEBSTER'S FIGHTING WORDS by Tracy Nelson Maurer gives a sense of what kind of person Noah Webster was. Here is a sample: "He argued in speeches....He argued at dinners. Noah argued A LOT." Here is an idea for a classroom exercise. Your class is having dinner with Noah Webster. What kind of conversation would they have? Since a new school year has started, I have decided to concentrate on interesting titles for the class room. My first one is called JUST A MINUTE : a Trickster Tale and Counting Book by Yuyi Morales. First grade teachers, this book works on a number of levels. First, it tells a story. 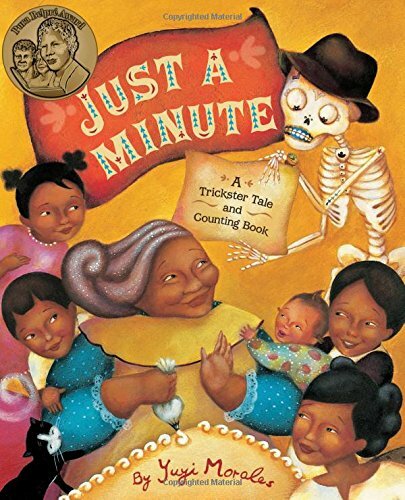 Here's a sample: "Senior Calavera tipped his hat. What a skinny gentleman! With a pass of his hand he signaled to Grandma Beetle." Numbers one to ten are embedded in the story and are repeated in Spanish. It's a chance for students to learn to count to ten in English and Spanish.